Protecting an infant from bacteria and viruses is critical. Here's how. Protecting an infant from bacteria and viruses is critical. Although babies are born with some of mom’s immunities, they have not been introduced to many microorganisms that can cause them to become ill. Therefore, you should wait six to eight weeks before exposing a newborn to a crowd. Take precautions with individual visitors, too. “Make sure anyone who holds the baby washes his or her hands first, and don’t allow sick people to come in contact with a newborn,” says Mary L. Gavin, M.D., a pediatrician in Wilmington, Del., and medical editor for www.kidshealth.org, which provides doctor-approved children’s health information. But whether you believe that “What won’t kill ’em will make ’em stronger” or you’re one to whip out the antibacterial sanitizer a dozen times a day, it’s likely your child will still get sick, because direct and indirect contact with germs are unavoidable, experts say. The good news is that your best defense for keeping your baby well is simple: thorough hand washing. 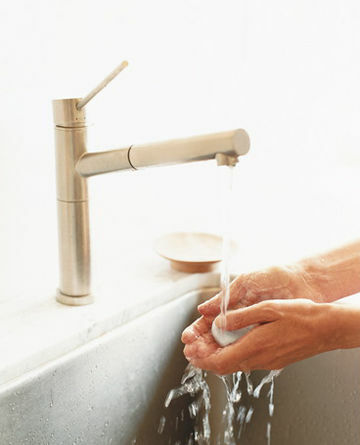 Hand-washing how-to’s “If done correctly, hand washing is the best way to combat germs,” says Philip M. Tierno Jr., Ph.D., director of clinical microbiology and immunology at New York University Medical Center Tisch Hospital and author of The Secret Life of Germs (Atria, 2004). “You need 40 seconds of hand washing to effectively slough off germs,” he says. Teach toddlers to sing “Happy Birthday” twice while scrubbing. Antibacterial soap can help, especially after handling raw meat. But, experts agree, washing with regular soap and warm running water will do; alcohol sanitizers aren’t necessary but can help when you don’t have access to these.